Add this simple printable jack-o'-lantern mini bunting to a frosted cake for an adorable Halloween dessert. Anybody else find themselves enamored with all of the adorable mini-buntings adorning cakes and desserts all over Pinterest? I love the simplicity and ease of these sweet little cake-toppers and thought I'd come up with a new design for Halloween. I shared this new bunting on Landeelu last month. Wouldn't it be the perfect touch to a dessert for a Halloween party! Glowing jack-o'-lanterns are one of my favorite Halloween decorations. Several years ago, I took this picture of a smiling pumpkin face. It's become a favorite image in my Halloween crafting and decorating. Some of you might remember it from the Halloween Glass Tile Pendant tutorial I put together last year. You'll also need a scissors or paper cutter. 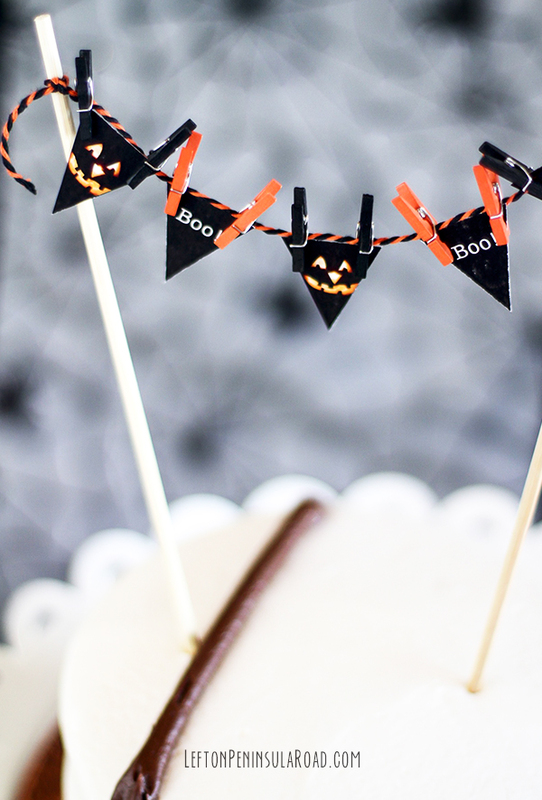 Click to download a copy of the Halloween Cake Bunting printable. Tie a length of baker's twine between two skewers and position by poking the skewers into the cake. 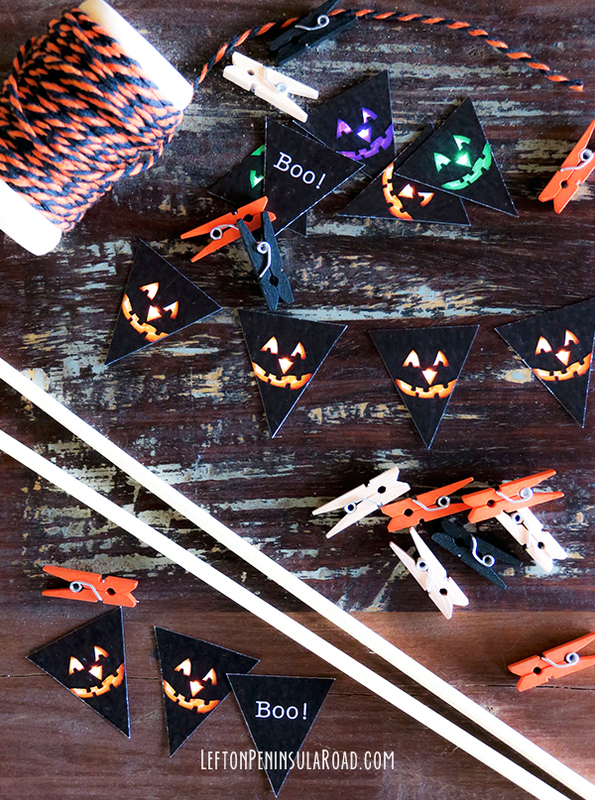 Use tiny clothespins to attach assorted bunting pieces to the twine. Or try stringing two pieces of twine for a tiered look. No miniature clothespins handy? Use a pushpin to make holes in the corners and use a needle to string the pieces on the twine before tying each end to the skewers. Display on a pretty cake stand. Wasn't that easy? I hope you enjoyed this simple Halloween cake decoration. These mini-buntings look adorable decorating picture frames, memo boards and even wreaths. 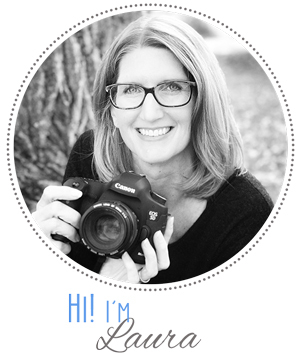 Check out how Landee has used other mini banners and buntings for inspiration! I hope this little printable makes it just a little easier to add a festive touch to your desserts this season. 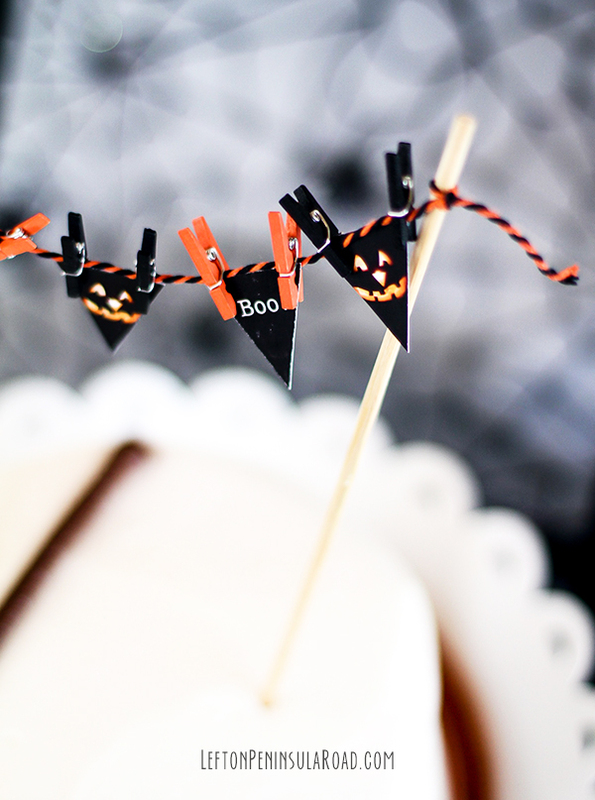 This Halloween Party Mini Cake Bunting was first shared with Landeelu readers on August 30, 2016. Glad you liked it Leanna. Thanks for stopping by! Super cute! I also pinned for the future. Thanks Terri. I hope you get a chance to make some! I love this idea of a mini banner for dessert, so cute.